Welcome to Part 3 of my travelogue (as it has been dubbed by several of you, my faithful readers!) from my trip to Yunnan and Sichuan with my parents back in October (has it really been two months already??). Part 2 ended with our flight from Lijiang to Jinghong, the capital of Xishuangbanna, a Dai Autonomous Prefecture in southern Yunnan Province. Xishuangbanna is a Chinese transliteration of “Sipsongpanna,” a Thai/Dai name meaning “twelve thousand rice fields,” which dates to 1570 (Ming dynasty). The region is in the far south of Yunnan province, (760km from Kunming) at a lower altitude than most of the province. Xishuangbanna has a tropical climate and lots of rainforest, and houses a wide range of unique plantlife. It borders Myanmar (Burma) and Laos, and is also very close to Thailand and Vietnam. Some of the most famous Pu’er tea comes from this region. The Mekong River (known as the Lancang in China) flows through Jinghong (the capital city). The area is famed for wild Asian elephants, along with peacocks and other wildlife, though none of them are common in the wild as they once were. The population of the entire prefecture is about 1 million. 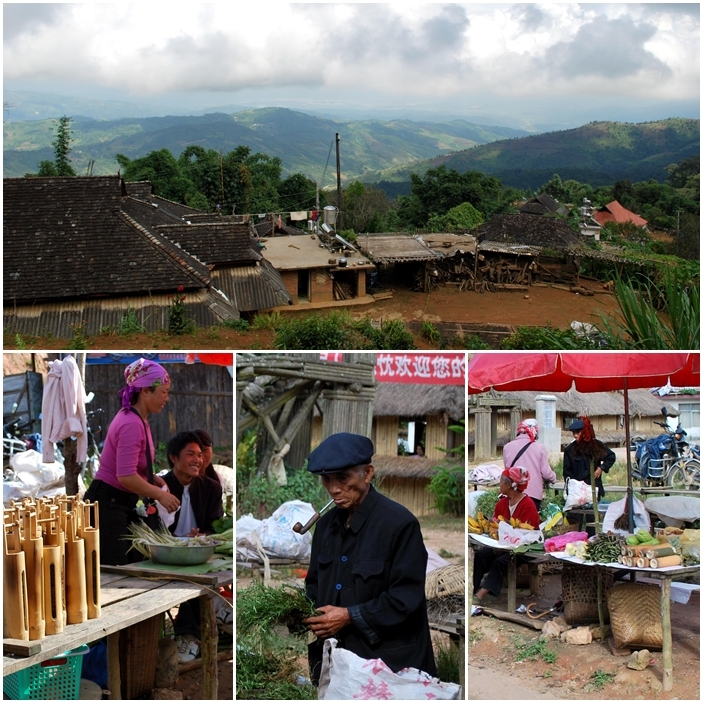 Many of China’s minority groups are native to Yunnan. There are more Dai people than any other people group in Xishuangbanna – including Han (who make up over 90% of China’s population). Xishuangbanna is approximately 30% Dai, 29% Han, and 19% Akha, with significant populations (10,000-60,000 people each) of Yi, Lahu, Blang, Jimo, Yao, Miao, Bai, Hui, Va and Zhuang peoples (as well as small populations of others). Friends of mine came to the airport to welcome us and take us to our hotel even though they were busy that night, which was lovely. After some time to settle in, the parents and I went for a wander around town, ending up in a little restaurant for cold noodles, fried chicken, and delightful fresh fruit juice blends. It was my third trip to Jinghong, and the (cheap!) fresh fruit juice is something I rave about every time! Totally worth any headaches the fruit causes me ;) On the way back we bought sweet fried bing from a street vendor – another of my favourite things from that corner of the country. Think of a flat naan type bread dough folded up and shallow fried in oil with a little sweet egg and fruit filling, with sweetened condensed milk drizzled on top. SO GOOD! We had originally planned to travel to Laos by bus over the weekend – we didn’t have much time but seemed like a fun idea. In the end we canned that leg of the trip in favour of some down time. Was definitely the right decision, I’ll just have to go back again for a trip to Laos ;) Saturday we had breakfast with friends and stayed chatting for hours. Next we picked up tickets our friends helped us book for a show that night, and ate Thai for lunch at my fav restaurant in town. SUCH GOOD FOOD! And with perfect SE Asian style lime juice drinks to go along with it. The concrete track was fairly smooth considering how steeply it wound around the hills. Very smooth compared to the rutted dirt shoulders we regularly moved onto (to allow a vehicle going the opposite direction to pass). We found out later that the road was relatively new – built by the government a year or so earlier; our guide said it cost about 1.5 million RMB. Given that our trip took about 45 minutes on the new road, I hate to think what that windy mountain road would have been like as a dirt track. Gives you an idea of how isolated some of these communities continue to be – geography alone is a large obstacle! As we climbed we saw terraced lines of tea plants on the neighbouring hillsides, and gates marking the entrances to villages (some saying they had been established hundreds of years earlier). We passed a boxy three storey building – stood out as VERY different to everything else we were passing. Our guide said it was the local primary school. Eventually we got to the end of the concrete, and moved onto a VERY bumpy road of orange dirt and large pebbley rocks. As we lurched all over the place I couldn’t help wondering if this was what the whole road used to be like! Thankfully we soon turned off onto a fully dirt road, softened by the overnight rain. We stopped by a house which looked down the hill toward the valley into town, built higher on the hill than all the houses around it. Our guide said this was his house, 1700m above sea level, looking down over an Akha village. He took us on a walk around the village, pointing out certain plants, including tea plants. He picked leaves and flowers from some tea plants for us to smell. They looked a lot like sasanquas. 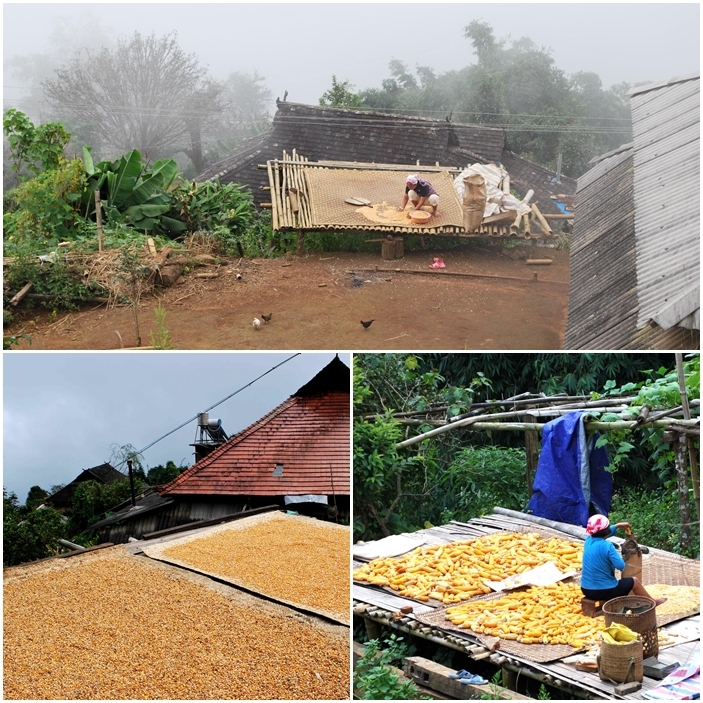 There was a lot of corn about, being shucked and laid out to dry. We saw one woman using a small hand-turned device that fed individual corn cobs through to be shucked. At the height of its population, the village had 100 families; now there are 28 families. The guide stopped to talk to an older man who lived in the house right below. He was carrying his granddaughter on his back while feeding the pigs. 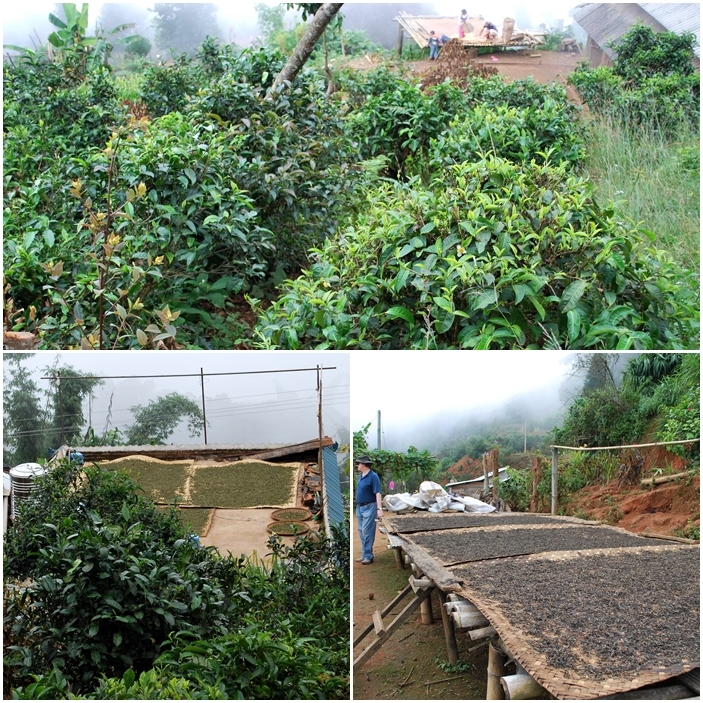 Tea leaves were spread to dry on large woven mats laid on raised platforms in the dirt yard. After a short conversation we were invited in to see their house. The family had solar hot water and various electrical appliances; they also had an indoor fire, set up where gaps in the eaves would draw the smoke up and out of the house, the embers kept hot so the flames could easily be ignited at any time for warmth or cooking. Our guide said this house was typical of the (pretty well-off, in his opinion) village – the electrical appliances common, many even having small sattelite TV dishes, and the traditional bamboo roof tiles long replaced with hardier versions. We went back to sit on rough wooden benches in the covered verandah of the guide’s house while lunch was underway. Watching the clouds rolling over us and back again was fun! We literally walked (danced!) in the clouds. Sometimes the view of the valley was clear, other times clouds obscured it completely. We saw a small snake, too, but it was too fast for us to catch! Lunch involved a lot of bamboo shoots, among other things, and I quite enjoyed it. The most interesting dish, in my opinion, was a yellow tomato salsa. Very good! After lunch we went on another walk, this time to the bottom of the village and into the rainforest. We stopped by a HUGE tree, covered in moss and tree ferns. The guide said no one really knows how old it is, but the village elders say it is a thousand years old. We walked the narrow dirt track a long way, more downhill than up. We frequently saw small patches that had been cultivated with rows of corn or, more often, tea. Tea plants seemed to grow wild everywhere. 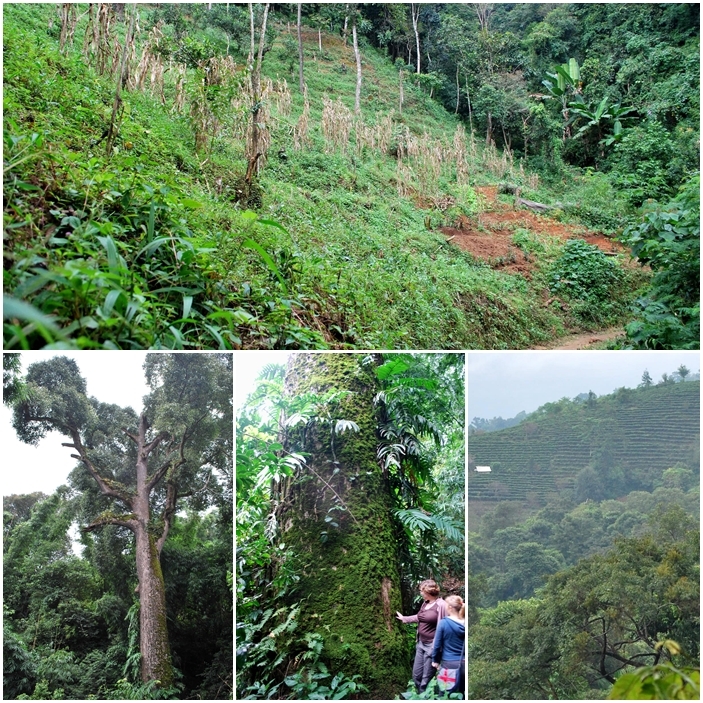 We passed another big tree and our guide pointed our attention to the top, where a banana plant had self-seeded and managed to grow! About 40mins down the path we came to a grove of old tea plants. Very old tea plants. Centuries old, in fact, and they looked it, all gnarled up on themselves. We walked up and down through the grove to the end of the path, where a huge tea plant sprawled behind a scraggly barbed wire fence. It is 800 years old. 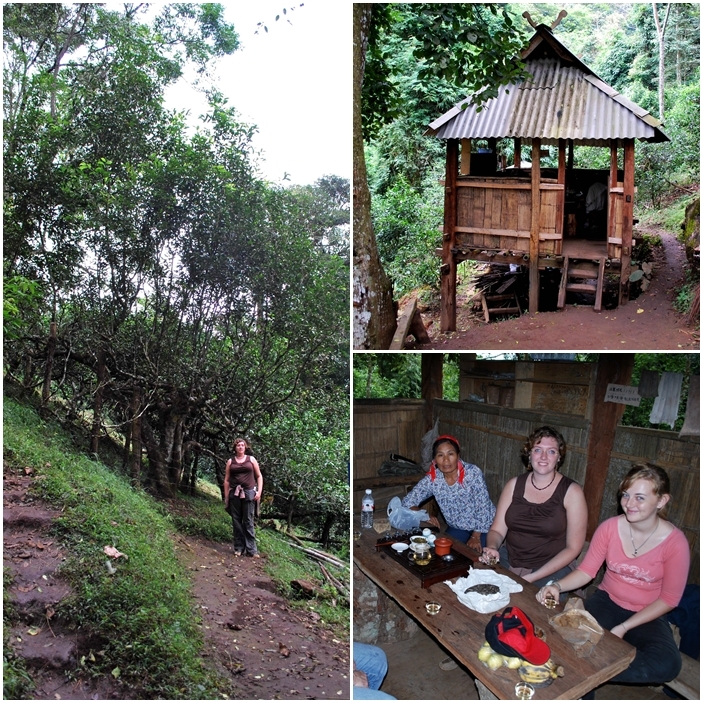 We then sat in the small hut, looking out over the rainforest, while a woman served us tea made from the old grove tea plants. We were starting to wind up our visit when we started to hear thunder. The guide and the tea lady looked a bit concerned and suggested we should be making out way back. We thought the rain would let up soon, but no. Another random person rocked up seeking shelter. He sat with us for a while before trudging back out in his plastic poncho. 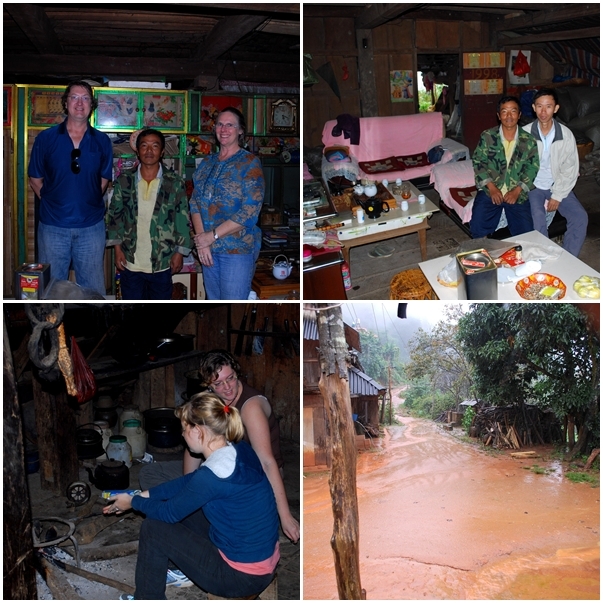 Eventually the homeowner returned, and he let us in to the house, encouraging us to sit and bringing us tea. His wife and daughter weren’t far behind. They brought us big bags of sunflower seeds to take with us when we left, and let my friend and I sit by the fire to warm up (I had a jacket but couldn’t wear it as it was around my waist covering the 20cm long rip down the back of my pants!) Turned out the guy was something of a local celebrity – a flute player who had travelled to Beijing with a troupe of Yunnan performers, been on TV, and other such exciting things. There was even a heavy card shopping bag with his picture on it hanging prominently in the house. He pulled out the flute and played a quick tune and one point, and I tried to play something simple as well, much to everyone’s amusement. After an hour or so of hiding from the rain, borrowed umbrellas we handed out and we began a trudge through the orange mud up the hill to the car. It took a while but we got there, intact, only a little wet but our shoes quite muddied! The trip back to town was smooth, and was followed by dinner with a bunch of people at my same favourite Thai place. SERIOUSLY good food, I’m telling you. Did I mention the food down there is AWESOME? On Wednesday morning we packed up our stuff and flew out to Kunming. We had a long stopover but decided to just hang out at the airport reading and hanging out rather than go exploring as we had originally planned. Our flight to Chengdu (capital of Sichuan Province) was delayed an hour and a half, giving us a tight connection to our flight out from there to Jiuzhai. When we arrived in Chengdu I talked to some people and discovered we had to walk to a DIFFERENT BUILDING to check into our connecting flight. We rushed to get there so we could check our bags through the requisite 30 mins before takeoff, only to sit around and wait an hour for the (delayed) flight to board. We did finally arrive in Jiuzhai Huanglong airport and began our trip to Jiuzhaigou. Stay tuned for more in Part 4!